South Korea’s economic policy veterans in chorus called for President Moon Jae-in to moderate his signature trickle-up income-led growth policy by paying more attention to market realities and business demands. 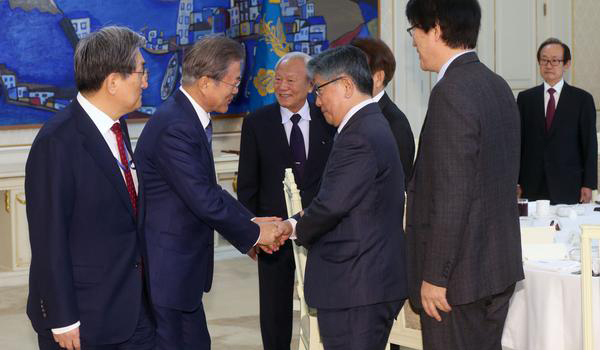 Moon, who has been meeting entrepreneurs of all sizes from the beginning of the year as he battles a sagging economy, invited on Wednesday former finance ministers, central bank chiefs and other senior government officials to the Blue House to hear their voices on economic affairs. While many agreed on the overall direction of the policy aimed to bolster income for growth, they pointed to the side effects of the steep minimum wage hikes and shortened workweek, and called out for a more fine-tuned and practical approach. Under Moon’s economic campaign to drive growth by fattening the wallets of average Koreans, the minimum wage was raised by nearly 29 percent in two years, from 6,470 won ($5.70) to 8,350 won. This was accompanied by a cut in the maximum workweek from 68 to 52 hours, a law that was enforced in July last year at large companies before being rolled out to smaller businesses. “The income-led growth strategy is more of a human rights policy than an economic policy,” said Chung Un-chan, former prime minister and president of Seoul National University. “It’s a good policy in the sense that it ensures a minimum income to live a decent human life but it doesn’t guarantee economic growth,” he added. He urged the government to slow down the pace of the wage hikes, saying that its goal to reach a minimum wage of 10,000 won by 2020 could be extended to the end of the term at 2022. Park Seung, former governor of the Bank of Korea, expressed his support of the general direction of income-led growth but at the same time highlighted the need to “maneuver policies in a way that helps achieve policy objectives.” He also stressed the importance of private sector investment and pushed the government to take more action in encouraging private spending. Kim Choong-soo, another former BOK chief, called for the government to attain broad consensus on its economic vision and rally public support by enhancing predictability of new policies. He also advised policymakers to work toward improving productivity in line with the wage increases. Moon’s platform of economic reform has faced fierce backlash amid a slowing economy and weak job market. The country’s gross domestic product grew at a 2.7 percent annual rate in 2018, its slowest growth pace in six years. The outlook is even grimmer this year, with the BOK and OECD projections set at 2.6 percent and Moody’s as low as 2.1 percent. Korea’s employment rate in 2018 also fell for the first time in nine years to 60.7 percent, with the jobless rate climbing for the fifth straight year to 3.8 percent.